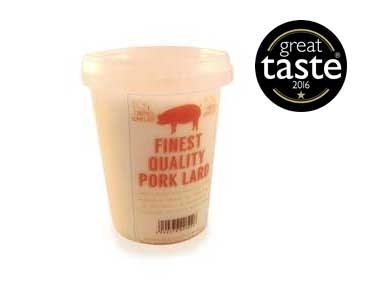 Our pork lard is made from the highest quality fat and is extremely versatile when used for cooking. Unlike some oils, pork lard doesn't smoke on high temperature making it perfect for frying, roasting and even baking flakey pastries. Having received a Great Taste Star Award, here's what the judges had to say: "A beautiful creamy colour and texture. The aroma is characterful but markedly clean. The aroma carries through on the palate - the flavour is gentle and clean; quite mild. Both at room temperature and melted the gentle flavour is very appealing and we did find the clean finish a happy one, ensuring the versatility of this product for pastry sweet as we as savoury."